Create effective email campaigns to reach and interact with your prospects. Proactively chat with your website visitors and convert them into prospects. Create, schedule and deliver your social media content when your audience is most likely to engage. Manage your sales pipeline, spot opportunities, increase win rates and grow your business. Deliver unmatched customer service across multiple channels, languages and time zones. Plan, track and collaborate on client deliverables using our project management tools. From click to deal, it's all in one place. Drill down your Google AdWords campaigns and improve conversion rates. Gain data-driven insights on your sales performance with smart dashboards and KPIs. 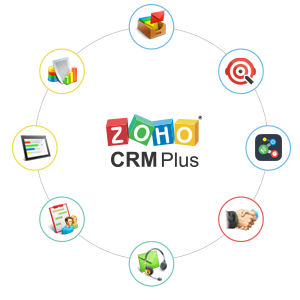 Zoho CRM is a cloud based solution that helps you track sales activities, predict customer behaviour, automate. Complete Visitor tracking software, for every user license, you can track up to 5k website visitors. For example, if you have purchased 20 user licenses, you can track up to 100k website visitors every month. Manage multiple social networks, schedule unlimited posts, monitor keywords, and collaborate with your team - all from a single dashboard. Create online surveys that integrate with your CRM contacts.